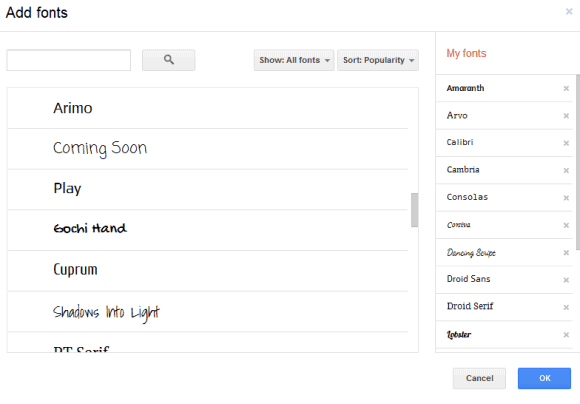 Google Docs tests another great feature: a font manager that will help you customize the list of fonts and add new fonts from the Google Web Fonts project. You can sort the fonts by popularity, by name or the date added and restrict the fonts to serif, sans serif, display and handwriting. There's also a search box that lets you find a font. For example, you can use the advanced search tool from the Web Fonts project, find your favorite font, then quickly add it to the Google Docs font list. You can try the new feature using this template (update: the document has been removed). Just click "use this template" and you'll create a new document that opens in an updated version of the Google Docs editor. 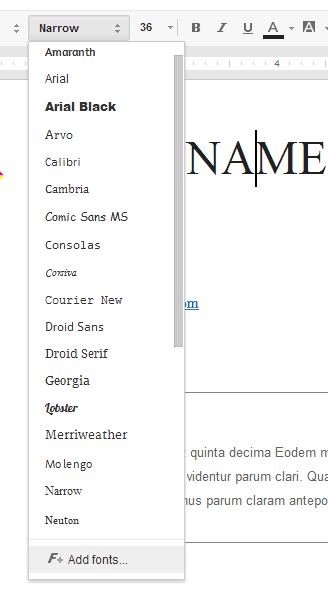 To access the font manager, click the font dropdown from the toolbar and select "add fonts" at the bottom of the list. It would be cool if you could add your own fonts (for example the ones that are freely available or you bought yourself). that make it more unique .. i also hope this feature will exist soon.. However it seems to be a really good feature! Cool feature. Hopefully Google provides ways in which we can buy new fonts or upload fonts we own from out computers.